I think we've all heard enough about Second Life, the cool yet clunky online virtual universe site... okay, just one more. Come on out and join in the fellowship! Stand up and be counted amongst the faithful in the name of the King! At Sunday's sermon we will be discussing the Official Cosmogyny of the First Second Life Church of Elvis. I mention it because it just so happens that this has been tried before by a real spiritual community. In 2004, the Ship-of-Fools website put up an online Church-of-Fools. Congregants were able to log on from anywhere in the world, and selected the pew in which they wished to sit. They introduced themselves to other worshippers via speech bubbles, listened to the sermon and chatted afterward. They were encouraged to continue their worship through gifts collected - even via SMS on mobile phones. Read more about Church of Fools and the apparent Rapture of the Avatar that occurred on their first Sunday. 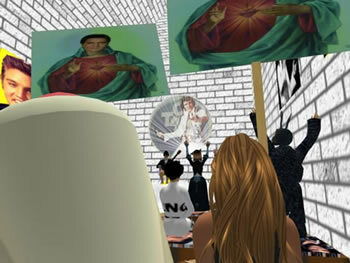 More on First Second Life Church of Elvis; thanks to Futurismic for their story.